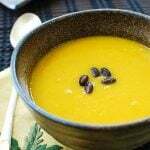 When I was a little kid, we used to get packages of dried goguma (Korean sweet potato) from our relatives in Jeju Island, where goguma was one of the major agricultural products. They would arrive in large brown bags, and I still have intense memories of the sweet aroma the little rounds of dried goguma produced right out of the bag. We stopped getting them at some point– it must have been after both of my grandparents passed away long ago. I had forgotten all about dried goguma until it suddenly came back to my memory a few years ago. 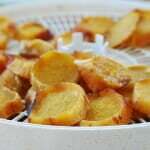 I started making them right away, using my dehydrator that had been in its box for two years. Dried goguma has become part of my life again as a staple snack for my family. 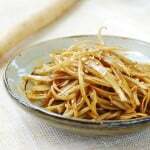 Dried goguma is called goguma mallaengi (고구마 말랭이). 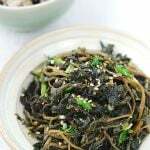 Mallaengi refers to dried food. 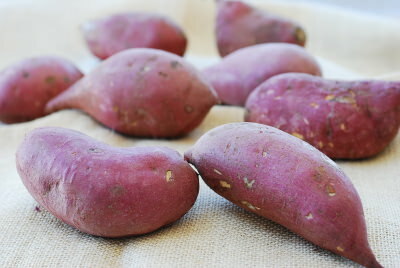 Korean sweet potato has purplish red skin and pale yellow flesh. It’s delicately sweet with a mild chestnut flavor. They are high in fiber and full of vitamins and other nutrients. 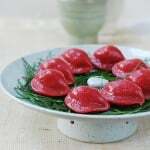 We love goguma in any shape or form! 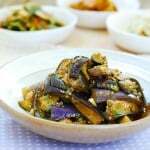 Whether it’s roasted, steamed, or fried, goguma is a hugely popular snack food in Korea. My father also started making these with a dehydrator my daughter got him for Christmas one year. He actually makes them on a regular basis for my brother’s family. My brother, his wife, the children, and the dog all love these, and my father takes great joy in supplying them with these tasty treats! 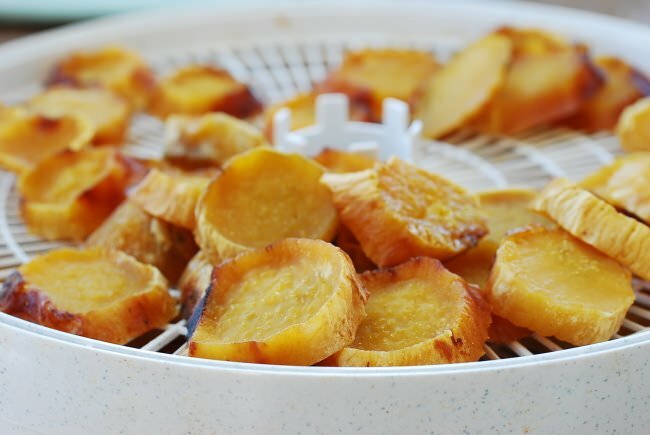 Dehydrating enhances the sweetness of the goguma while giving it a chewy texture, not to mention it also provides portability and a longer shelf life. If you like dried fruits or jerky snacks, you will love these! Seriously, I haven’t run into anyone who doesn’t! 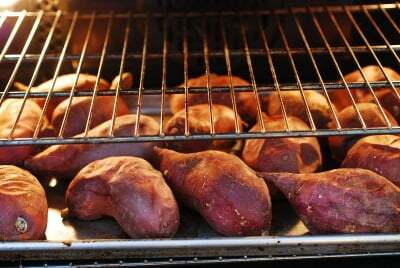 Preheat the oven to 425 F. Place the sweet potatoes on a cookie sheet or roasting pan. Roast the sweet potatoes for 45 to 60 minutes until cooked through, turning them over the middle of the way. Completely cool, and peel off the skin. 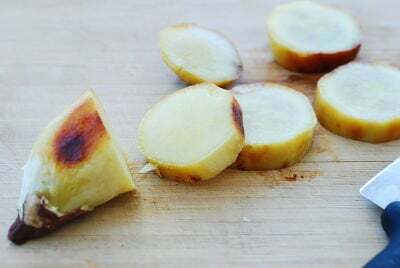 Cut the sweet potato into ½-inch rounds. Arrange them on the dehydrator trays in a single layer. 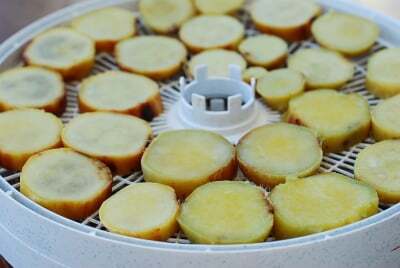 Set the dehydrator to 135 °F (fruit/vegetable setting). Dehydrate for about 12 to 16 hours, depending on the moisture content. 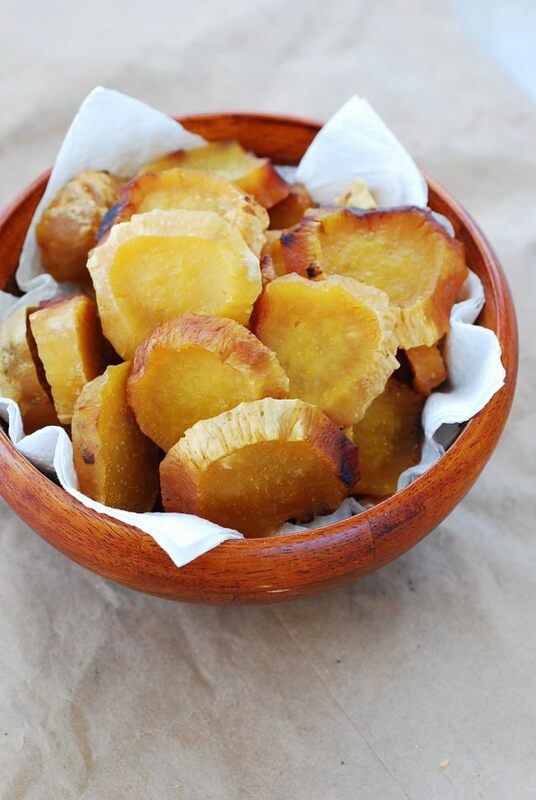 In the absence of a dehydrator, is there any alternative method to making this yummy 고구마 말랭이 please?! You can dry them in the oven at the lowest temperature. Mine is 200°F. With the heater running in the house, you can also try to air dry in the warm area, but it will take much longer, probably 2 to 3 days. That’s if you leave them alone and don’t eat them up while being dried. Also, you can try to dry in the oven for a few hours and finish by air drying at room temperature if you don’t want to have the oven run for that long. Hope this helps. I tried it last night in the oven at the “warm” setting (which is lower than the lowest temperature of 200). And it worked fine. Hi, can you please tell me how long you dried them in the oven for? Thank you! 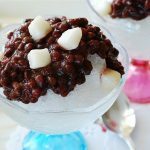 Hyosun, thank you for posting this recipe! I had this years ago when I was a little girl growing up in Vietnam. This delicious dish would appear along with other confections on a beautiful tray that we put out on the coffee for the visiting guests during the Lunar new year celebration. 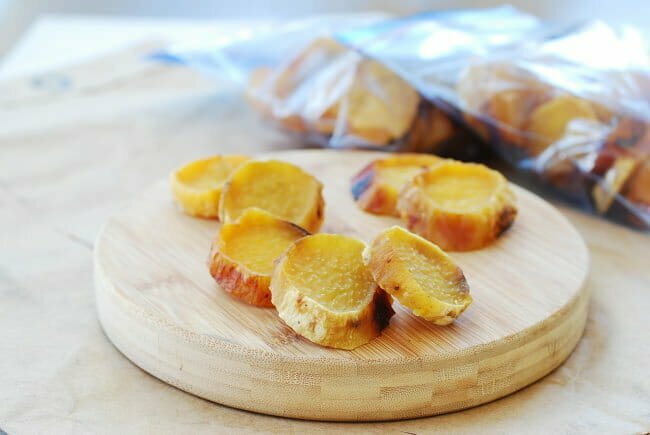 I forgot about the dried sweet potatoes until I come across this recipe. Atlas, all the happy childhood memories come rushing back and I’m so thankful for that. 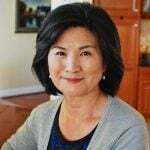 Thank you for sharing your recipes with us! If I dry them in the oven, do I need to line the cookie sheets? Will I need to flip them after a few hours? I just came back from the Korean market with a bag of goguma and will get going with cooking them once I hear from you. Thank you! It will be better if you directly place them on the oven racks using the “warm” setting. Enjoy! Hi Hyosun, my first time attempt at drying the yam in the oven turned out pretty good! It is nice and chewy. However, the outside of each slice is a bit crispy for my taste. Is there anything I can do in the future to keep the outside as moist as in the middle of the yam? Thank you! Please disregard my question above as the yam become chewy nicely upon standing. The crispy parts become chewy too. 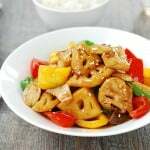 Thank you for sharing the recipe with us! A couple questions- once these are dried, how should they be stored, and how long will they keep? Hi Zora – You can store them closed in a storage bag or any container with a lid. If you leave them open, they will continue to dry. Depending on how dry they are, they can keep for weeks at room temperature. You can also keep them in the fridge if you want to keep them longer. Enjoy! I can’t wait to make these. I have always loved eating the baked sweet potatoes after they have sat on the counter a few days and dried out a bit. Now I don’t have to wait! Christina – You’ll really like these. Sweet potatoe season is coming up, and I already see new crop Korean sweet potatoes in my area. Hope you make them soon. Enjoy!